Forty-five years after serving there, one veteran FSO encounters the new Vietnam. 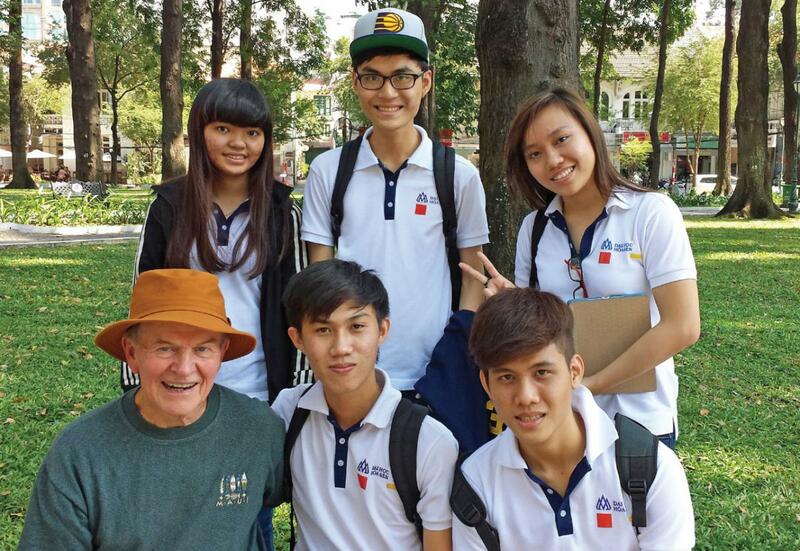 Parker Borg with five students from Hoa Sen University, a private university in Ho Chi Minh City, in February. The students stopped him on the street and asked to interview him in English about his reactions to the city, explaining that it was an assignment for their English class. Then they requested that he pose with them for this photo. Their friendliness was typical of the reaction Borg and his wife found everywhere in Vietnam. The dry season’s dusty, smoky haze; the blend of cooking smells with more putrid street odors; the seeming indifference about trash; the friendly faces becoming even more so when we identified ourselves as Americans; the apparent joy in trying to speak English; the preference for dollars (currently $1 is worth 21,000 dong); and the constant noise from honking horns, cackling voices and background music (in restaurants and bars, American pop hits of the 1960s like “Yesterday” and “Like a Rolling Stone” were common) were all familiar. In so many ways, it seemed little had changed since I left Vietnam 45 years ago; but I quickly realized these superficial similarities were only a small part of the story. I had returned to Saigon (now Ho Chi Minh City) in 1999, but this was my first visit to the towns of central Vietnam—Quinhon, Pleiku, Kontum and Nha Trang, where I'd lived and worked from 1968 to 1970 and again in 1973. This January trip would be a chance to show my wife, Anna, my old haunts for the first time. Ho Chi Minh City has become the city Saigon always wanted to be. Free of barbed wire and signs of strife, its broad avenues (frequently renamed for political correctness) were still clogged with traffic, but now they were lined with freshly painted buildings and elegant shopping malls, small shops and more than a few skyscrapers. Vietnamese entrepreneurs seemed to be continuously transforming the economy. One could buy just about anything. Some members of our group concluded that the South had clearly prevailed in the postwar period—capitalism had trumped communism. But the story was much more complicated, of course. 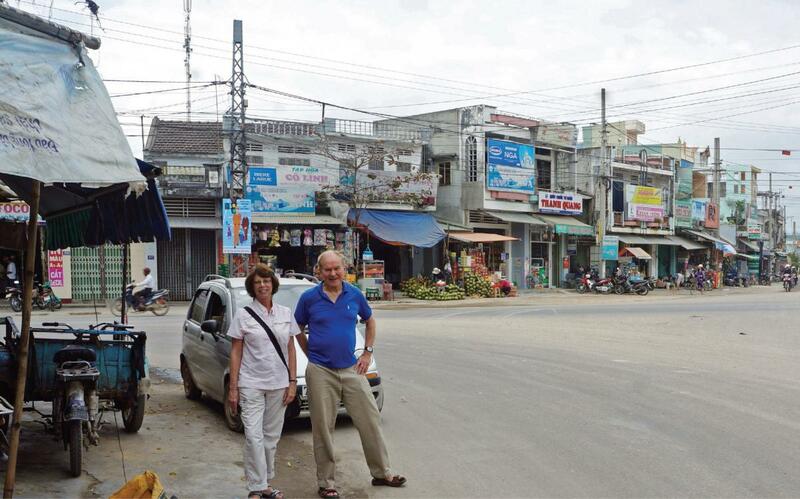 Parker and Anna Borg stand at the crossroads in the center of Tuy Phuoc, the district where he worked from 1968 to 1969. (He recognized no buildings from the past.) Low buildings like those shown here sprawl along the roads for three to four miles in all directions outside of every urban area in this part of central Vietnam. We were seeing Vietnam as it appeared in 2015, not what it had gone through in the decades after 1975. In addition to its reeducation programs, the North had established a Stalinist system of political control, implemented land reform, seized private enterprises and even expropriated houses. By the 1980s, rice-producing areas were threatened with famine, the economy was collapsing and inflation had tripled. In 1986, following the lead of Deng Xiaoping in China, the Vietnamese government began to open its economy to market forces. The changes were gradual, but ownership of land, enterprises and homes was eventually privatized. Often properties were returned to their original owners, although there were more than a few stories about socialist cronyism. We were seeing the new Vietnam, a more entrepreneurial Vietnam, yes. Small shops lined the roads into and out of every settlement. But often the structures were shabby, even though they were of relatively recent origin. A very successful businessman (or somebody with a foreign source of income) might put up a narrow, one-lot-wide, six-story, brightly painted edifice, particularly in a bigger town, but most buildings were dingy and only one or two floors tall. The newer structures were mostly official: government offices, schools, hospitals and military camps. 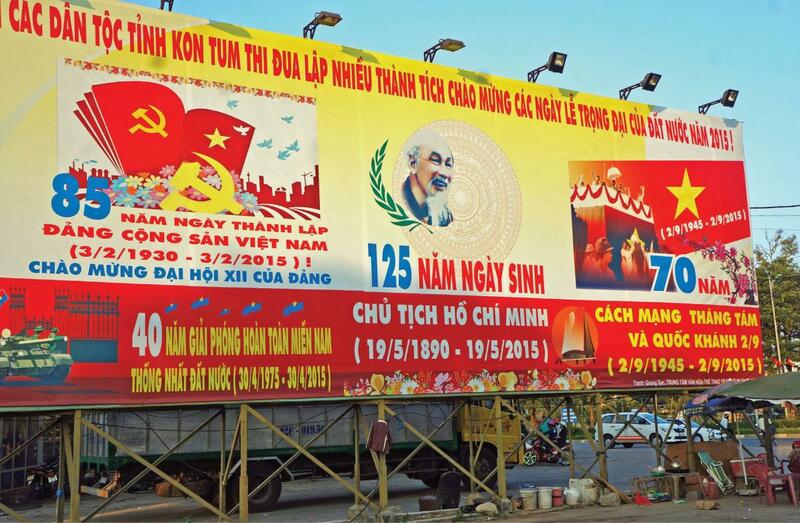 Billboards mark Vietnam's major 2015 celebrations. From left: the 85th anniversary of the founding of the Communist Party of Vietnam, the 125th anniversary of the birth of Ho Chi Minh, and the 70th anniversary of the revolution and National Day (the proclamation of independence by Ho Chi Minh in Hanoi at the end of World War II). On the lower left is a much smaller reference to the 40th anniversary of unification: the image of a tank, entering the gates of the former Independence Palace. The military presence seemed to be everywhere: on former South Vietnamese and American bases and the old district headquarters, all freshly painted ochre, three or four stories high with red-tiled roofs and surrounded by walled compounds. The war was over. Who was the enemy that required such a strong military presence? Likewise, similar communist party offices were part of each district. What were all these party groups meeting to decide? Nothing seemed overt, but a strong political-military presence was evident everywhere. Traffic on Le Duan Street near Saigon Cathedral heads toward Independence Palace. 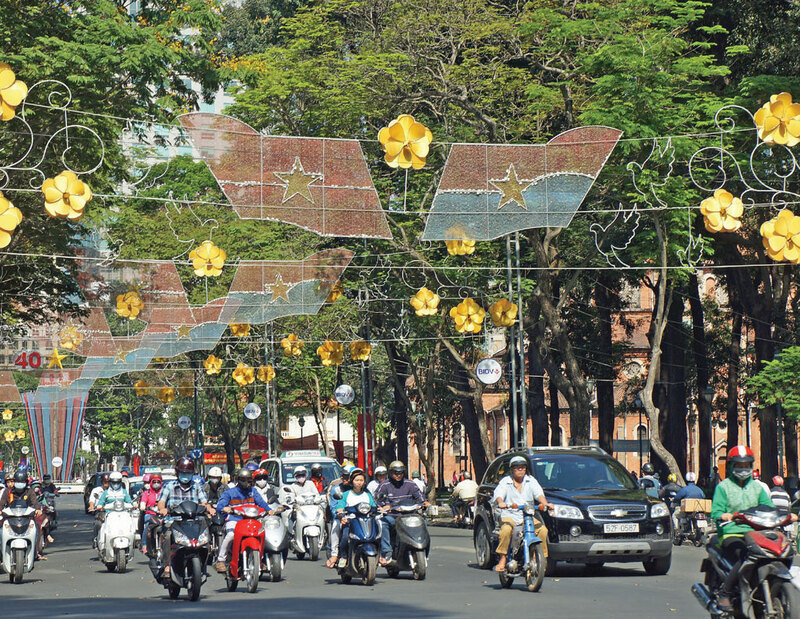 The decorations above the street show the Vietnamese government flag on the left and the former Viet Cong flag on the right, along with doves, flowers and the occasional “40” to mark the anniversary. The U.S. consulate general is about six blocks down the street. Sprawl is an easy word to define modern urban life in Vietnam. This increasingly urbanized country now has about 92 million people, twice the number its two halves had in 1975. Of course, old Saigon sprawls, but so does every other urban area, making them virtually unrecognizable to a visitor from the past. At least the old capital had its landmarks; the cities and towns we visited in central Vietnam often did not. Not only had old buildings given way to new, but the urban centers had shifted and been extended for miles in every direction. The old town centers were hard to find. Heading out of Pleiku and Kontum into areas tradition ally inhabited by Montagnards revealed another important difference. All the Montagnards had been settled with size-designated plots of land. Slash-and-burn agriculture had been forbidden. This opened vast tracks of land for Vietnamese settlement, mostly by northerners sent south as pioneers to make productive the newly acquired fields with rice, coffee, cinnamon and other spices. We visited officially sanctioned Jarai, Bahnar and Lac villages. Life goes on in them, but it was clearly a different life from the past, one that required regular interaction with the new Vietnamese majority everywhere. No threat of an insurgency here. Another omnipresent part of life in the south were the posters and banners noting commemorative events and celebrating life in the socialist republic: flags along the streets (a single yellow star in a red field for the government and a yellow hammer and sickle in a similar red field for the party); banners across streets at regular intervals (also predominantly red with yellow lettering); and many billboards noting that 2015 would be the 85th anniversary of the founding of the Vietnamese Communist Party, the 125th anniversary of the birth of Ho Chi Minh, the 70th anniversary of Vietnam’s independence and the 40th anniversary of reunification with the South. In other places, we saw the leftover billboards from the commemorative events of 2014. Private advertising along the sides of the roads or in towns, however, was non-existent. Entrepreneurs seemed able to publicize their activities in the press, with handouts or on TV, but not with billboards. While monuments commemorated northern victories, they were all victories against the Americans. While monuments commemorated northern victories, they were all victories against the Americans. We saw no references to the role of southerners in the struggle, except occasionally as puppets of the Americans. The southern dead did not seem to be memorialized with any of their own monuments or cemeteries. Those southerners who fled after 1975 did so for economic reasons. Hanoi had fought and repelled the Americans. 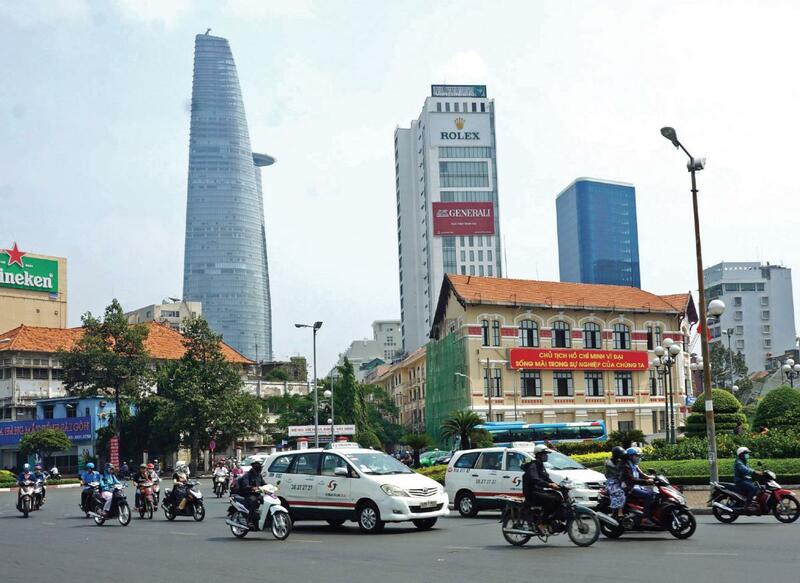 The skyline of Ho Chi Minh City as it appears from the circle in front of the Ben Thanh Market. The tall building in the background at center left is the Bitexco Financial Tower, the tallest building in the city, a 68-story structure inspired by the lotus flower. The red sign on the building across the circle says in rough translation: "President Ho Chi Minh lives forever great because of our industriousness." What does one make of the new Vietnam? A very wise Vietnamese explained that his generation had all gone through “re-education” if they had not been believers. The next generation picked up the message about the Vietnamese victory over the Americans in school. Some believed it; others were skeptical. He said the really interesting groups are the people under the age of about 35. They are cynical about what they learned in school from professors who couldn't answer questions about history and gave rote answers to their inquiries. They are, however, sufficiently connected to the outside world with cell phones and social media that this matters little. They don't care about history and politics. They want to be connected with their peers in the rest of the world, making money. This is the new Vietnam. Parker W. Borg is also the author of “Mobilizing for South Vietnam’s Last Days” in this issue. Click here for his biographical information. All photos are courtesy of Parker Borg.